Researchers used X-rays from a particle accelerator to reconstruct the portrait of a woman Vincent van Gogh had painted over before composing his landscape "Patch of Grass," completed in 1887. Conventional X-rays used in previous analyses had produced only rough outlines of the portrait. The image, unveiled in a scientific journal published this week, bears a striking resemblance to a series of somber portraits the artist produced in the Dutch town of Nuenen, where he composed “The Potato Eaters,” completed in 1885 and regarded as his first major work. An amazing discovery. 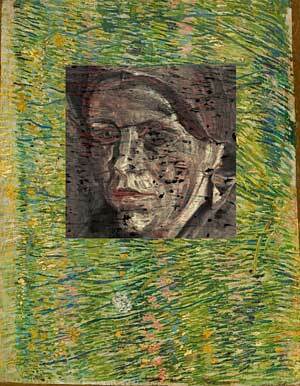 See High-tech study reveals early Van Gogh work beneath another painting for the rest of the story in the L.A. Times. What lies beneath? Perhaps the most important question that art, even language can express.